Marie Kuch-Stanovsky, Pacific Northwest Conference, presents the minority report from the Financial Administration legislative committee recommending divestment from fossil fuel companies. Photo by Rev. DJ del Rosario for the PNW Conference. While United Methodists seeking divestment from fossil fuels mounted a spirited campaign on behalf of creation, efforts to add fossil fuel screens to United Methodist investments did not prevail. If the legislation had passed, it would have changed Paragraph 717 of The Book of Discipline. The proposal to add fossil fuel screens was part of a minority report to Petition 60036 that failed 462 to 258. Passage of the petition would have required the financial administration of the church to add fossil fuels to socially responsible investment screens that become part of a list of industries in which the church does not invest. 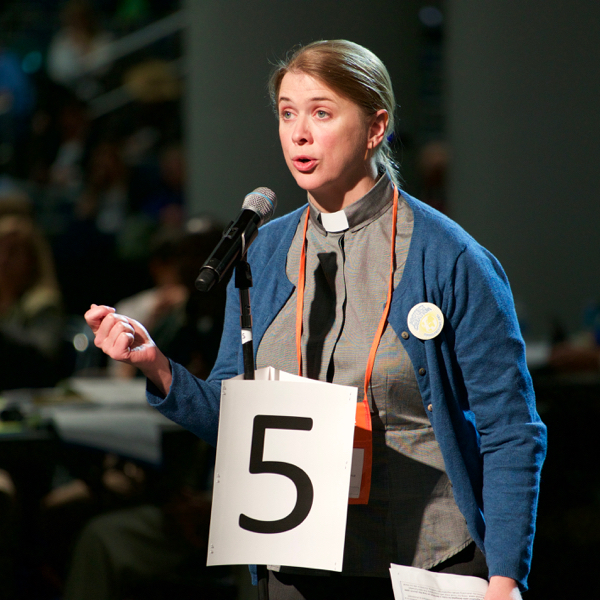 Marie Kuch-Stanovsky, lay delegate from the Pacific Northwest Conference and head of the delegation, was disappointed that the minority report requiring the fossil fuel screens failed to pass in the vote of the General Council. Another disturbing change to the Book of Discipline included language calling for “Sustainable and Responsible Investments,” she said. While on the surface, sustainability might seem like language supportive of creation, Kuch-Stanovsky viewed it as corporate language that actually supports profits first over creation. Under the leadership of Rev. Jenny Phillips and Kuch-Stanovsky, significant effort has been made in the Pacific Northwest on behalf of the environment. Notable areas of work are outlined on the PNW website. For United Methodists throughout the world, church finances speak to the faithful’s commitment to caring for what God has created. For example, investments that earn dividends for the church and pensions, can also represent harm to the environment. It is this type of investment that Phillips and Kuch-Stanovsky have sought to eliminate. There was a positive outcome in the form of support of the fossil fuel screens language by one-third of the delegates on the Financial Administrative Committee, Kuch-Stanovsky said. Moving forward, “We must continue to advocate for the church to employ its moral voice on this,” she said. Grateful for the opportunity to work on behalf of creation, Kuch-Stanovsky took issue with General Conference’s “procedural maneuvering” that kept the church from taking a strong stand. “By not inserting fossil fuels we are again in the tail lights of social change,” she said. Pam Brokaw serves as pastor at the Castle Rock and Winlock United Methodist Churches in Washington. She is a member of the PNW Media team serving at General Conference 2016. An important correction: the minority report vote did not fail 630-101 as it is being reported here and elsewhere. The vote against the minority report containing fossil fuel divestment was 258-462. The 630-101 was on the majority petition after the divestment decision had already made. While still a clear vote against, it’s important to me that we honor the many supporters we DID have! Thanks for the correction. We’ll update the article with the correct numbers.